Every once in a while, we may feel the need for a fresh perspective. We may find ourselves in an unfamiliar position without truly knowing how we arrived there. In general, we know that we have extreme potential to benefit numerous people as well as ourselves. Yet we failed to immediately realize how that benefit can practically manifest. For a number of months, many of life's issues have divided my own focus from my dedication to disclosure and the mass awakening of humanity. There have been challenges to meet the needs of thousands of people as well as my own needs. This situation offered little flexibility toward meeting personal needs—so much so that I found myself wondering whether or not I could continue publishing. However, there is still a job to do with regard to assisting the people in awakening. The desire is there, and as usual, the universe always provides a way. From my experience and my observation, it seems clear that in many ways, the collective needs of the people have changed. It appears that even the average person now knows at least something about the truth behind the corporate media and the lies that the corporate world sells us in exchange for our servitude. Though many people have allowed themselves to be manipulated by false narratives as to what the true issues are behind the scenes, most people are aware that the world is not as it seems. This mass deception that most people have been awakened to has shown that the truth and disclosure movement has made significant progress, and this is an extremely positive change in our society. However, there are numerous distortions which have arisen which can make it difficult to continue on a true and reliable course toward the complete truth of our situation. I have written about the need to be aware of the common use of logical fallacies, as these are the trademark of manipulative and untrustworthy parties. These fallacies have been an interesting subject to write about. However, they do not seem to serve the greatest need at this point. The need to address and establish the use of logical fallacies tends to arise on a situational basis, and these digests can be helpful. However, it is very easy for anyone to learn about the numerous types of psychological manipulation that manipulative people employ. This realization further presented the question of what was truly beneficial for my readers than simple information. There are numerous reliable and honest sources reporting objectively and responsibly to the people. Each of these sources are doing their part in disclosing the truth to the masses of people hungry and waiting for a taste of real world outside of the illusions they have realized themselves to be living in. So where does the need lie? The Eclipse of Disclosure conference was a life-changing event for me along with hundreds of people. These changes seem to be fanning out into the collective consciousness of the world population. But where do they lead? As previously stated, the need has changed. Those who previously awakened are no longer laying around in bed. They have become active in their communities and progressive toward world liberation, unity, and awakening of the people. Consequently the need to connect with the people has become greater than ever. For if we do, we can combine and magnify our efforts in ways we could not achieve on our own. The prospect of a complete disclosure is an obvious necessity for our world at this point. The secrecy, lies, exploitation, mass murder and genocide have lasted for long enough, and it has become completely obvious that official secrecy commonly leads to very negative results. Consequently, Full Disclosure will be an even greater focus on DTM. For more on Full Disclosure, click the following links. 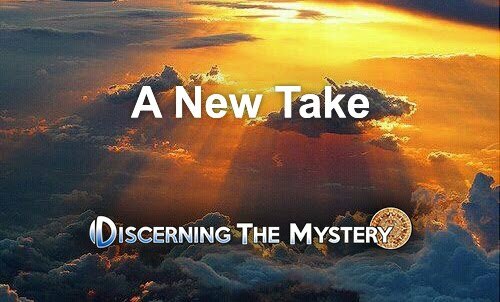 When I created Discerning the Mystery, I had no clue what I was doing. I knew there was truth the people needed to be exposed to, but had no idea how to communicate it. I was basically writing whatever was on my mind on the subject of awakening—particularly that which I had found most helpful during my ongoing awakening experience. Many people have told me how much they appreciated my work up to that point. (They should know that I appreaciate all of them/you as well.) Among all of the testimonies people have shared with me about the DTM site, the handful of people who told me that my work help them awaken—these instances had to be the most satisfying out of my entire writing experience. I recently had a good talk with a friend who asked me what my passion was. He gave some good advice and suggested that my passion should guide my focus on DTM. This left me with a certain dilemma. For the longest time, I have felt as though I did not have a passion relative to the physical world around me. Though I used to have several, most of these former passions have either been taken away from me due to health issues, or I simply moved on to other things. After these changes, there seemed to be no single subject of study which I wanted to focus upon more than the others. Many of my awakened friends have that focus and that drive to pursue specific topics, and that's amazing. I can relate to some degree, but the fact is that there is no singular subject that drives me. In truth, they all do, but it is not until a need arises that I pursue a particular subject. The truth is that my interest is everything and nothing at the same time. I could research in any productive direction or speak on any subject granted I have the knowledge to support what I say. Any blank I might draw is an opportunity for my own growth. However, when I consider the question of what I might be interested in, nothing comes to mind. It took me a long time to figure out why this was. In the process of awakening, there is always a desire for new knowledge. However, in my present case, there is no desire unless that knowledge can benefit others in some way. Maybe there is more to this that I need to pursue, but for now, this is where I find myself. In short, my passion is your growth (not to sound cheesy or melodramatic). My goal is your progression along your own path of awakening. This starts to sound like a similar role I have played in past/future lives (at least I've been told), but that is beside the point. This overall focus leaves a very big opportunity for the Discerning the Mystery website. The DTM website was created to help people gain the ability to blaze their own trail. What better way to do this than to present your questions and receive content that directly addresses those questions? In this way, everyone can contribute to content on the DTM site, and as I learn, so do all of those who present questions and search intently for the answers. I want the DTM website to consist of whatever helps you achieve that growth you desire to have in the most efficient and effective way possible. There are countless subjects that we could discuss, but there is an interest you have. There are questions that you have sitting at the back of your mind that you may not be away of. These questions have come up here and there for you. Of course, there will still be quality content aside from these questions and answers including material on unity, community and Full Disclosure, but the need for specific areas of study and growth potential are of great importance, I believe. This is the aspect of the DTM site that I am honestly looking forward to creating the most. This is because improvisation is the nature of the universal experience. So here is my request. I would like you to help me shape the DTM website by sending me your questions. In fact, I want you to send me so many questions that my email inbox breaks and the Gmail server crashes. It's not likely we'll break many servers, but you get my meaning. I'm excited to help you find the resources you need in order to awaken even further and reach the level of progress you desire to reach. I look forward to hearing from you all. Please send your questions to dtm2000plus@gmail.com. Personal Note: To anyone living in the Pacific Northwest of the United States, I am currently looking to relocate to the area of Eugene/Springfield, Oregon area. If there is anyone who happens to be looking for a roommate or housemate, please contact me. Particularly, if you are looking to receive advertising for your community-building organization, this may offer a great opportunity for all parties involved. If anyone is interested, or knows of anyone looking for a roommate, please send me an email at dtm2000plus@gmail.com.